Lately, my brain is running on overdrive thinking about recipes and healthy meal ideas. I have so many recipe ideas but just not enough time to share them all. When you have a little one who is sick AND teething, time just vanishes. This week, with the lack of time, I’ve really been focused on time-saving healthy meals. It’s so easy to make excuses for eating unhealthy when you are super time crunched (and possibly sleep deprived). Which, had me thinking…what could I make in the crock pot this week that would really help make meals simple and easy?! I have a dear friend who works for a food distribution company in St. Louis, Kuna Food Service. They are an awesome company and they try to source a lot of local foods and they carry very good quality meats. I recently got some amazing grass-fed ground beef from them. The kicker is, I have to buy in large portions since they distribute to restaurants. So, I had a 5 lb bag of frozen ground grass-fed beef that I wanted to thaw and use, so it got me thinking of how to utilize it all. Even if you don’t have a friend in food distribution, you can get a lot of great deals at Costco. Last weekend I also hit up Costco and grabbed two organic whole chickens. Or, if you have the freezer space, the best thing would be to buy a half or quarter cow from a local farmer, but few people have the space for that. I prefer to pack a lunch for work, so these meals gave me plenty of left overs for that (and even had extra burgers to freeze for another time). When I made the rice for the stuffed peppers, I made a large batch (2 cups uncooked or 4 cups cooked) which allowed me to use in various things throughout the week for quick meals. 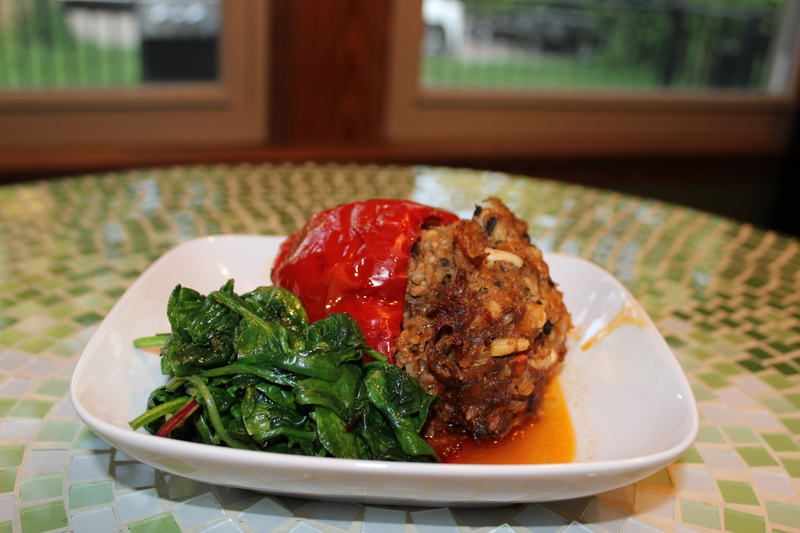 Today I’ll share the stuffed pepper recipe. You seriously cant mess these up so feel free to play around with the veggies you use and the ratio of rice to beef. If you wanted to cut back on the beef, you might even substitute some ground turkey for all or part of the beef. These are so simple and the crock pot does all of the hard work for you. I just got a new Kitchen Aid mixer and it works fabulously for mixing. Of course, and old-school hand mixing does the trick just fine as well. Then take 6 large multi-color bell peppers slice off the top and use a small knife to slice out the seed membrane and clean out all of the seeds. Stuff the meat mixture into each pepper and prop open-side up in the crock pot. 6 peppers should all fit perfectly in a standard sized crock pot. I sautéed up some mixed greens with garlic and sea salt and served on the side. It complemented the peppers really well.